If you are considering becoming a pet groomer or adding such services to your existing business, now is a great time to do so. Here are some tips to help you get started. Pampered pets are all the rage these days, as evidenced by the growing popularity of doggie day spas and pet groomer salons that offer services ranging from high-fashion haircuts to "peticures," massage and aromatherapy treatments, even facials—and pet tattoos! On the more practical side, many pets merely require simple bathing, hair trimming, nail clipping, and other old-fashioned pet groomer services. Either way, Americans spent $4.16 billion on pet services in 2012 alone, and that number is expected only to increase. For those who wish to get on the pet groomer bandwagon by offering in-store pet grooming services, here are some basics. First, a prospective pet groomer must really love animals, have a lot of patience, and have a good rapport with pets, as well as people, for this endeavor. So start by doing some research on pet groomer careers and the market in your area. Consider how much you will need to make and what you will need to charge for your services. At first, it can be a little tricky to determine a proper pricing strategy. You can start by checking out the competition and evaluating your potential client base. It's also important to evaluate the area market in terms of potential competition, your location, and if you have enough funds for start-up expenses because, initially at least, this is an expensive undertaking. As this is a very physical endeavor, demanding that you lift pets and engage in other tasks that require strength and stamina, you should determine if you are capable of this. Remember to take your other health factors into consideration. If you have asthma, arthritis, or pet allergies, for example, this may not be the right undertaking for you. Does your establishment have the right amount of space to accommodate pet groomer services? You must also have the right kind of space, preferably tiled or another water-resistant flooring, proper plumbing, convenient access to bathing facilities, and safely placed electrical outlets, among other features. Cleanliness and safety are vitally important as well. Licensing and formal schooling are not required in order to become a pet groomer. In fact, many groomers rely on on-the-job training or apprenticeships to learn their skills. However, it's highly advisable to seek professional schooling and certification for greater knowledge and confidence, so that you can safely and effectively service your four-legged customers. There are a number of online and correspondence courses, plus continuing education programs and vocational schools that offer comprehensive pet groomer training, which can lead to certification. Some states require that groomers obtain licenses to administer flea and tick treatments. A school or program administrator can tell you if you need this, and how to go about becoming licensed. 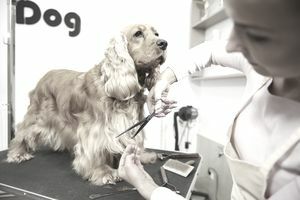 While vocational licensing is not required at this time, your city or municipality may demand that you acquire certain business licenses and permits, even if a pet groomer is doing this out of their home. Check with the city, town, or county government offices to learn what is required. Another good resource is the local chamber of commerce. Insurance is a must, as even the most competent, cautious, responsible pet groomer is not immune from accidentally injuring animals due to grooming mishaps, pets' possible allergic reactions to products, and other potentially hazardous scenarios. General business and homeowners insurance does not cover these. So do your homework in regard to what type of small business insurance that's required. The most common form is liability insurance tailored to this particular business. You may also want to consider adding commercial/general liability insurance. As this is a very specialized business, which presents the potential for accidents and injuries, it's important to obtain the right kind of insurance coverage. Another popular trend is mobile pet grooming, totally self-contained vans that travel to pets' homes enabling a pet groomer to perform services right outside a pet's door. Self-service dog washes, which provide facilities for people to bathe their pets themselves, also are gaining popularity. Some car washes are even adding these, to expand their businesses. The latter may have a part-time groomer on staff, to provide services the owners can't perform themselves. So this may be a good option for those just starting out. While pooches comprise the majority of patrons who seek pet grooming services, be prepared to cater to cats, as well. In addition, you may be asked to service such pets as rabbits, ferrets, guinea pigs, and other small exotic pets.